We have already seen complicated way to embed and show Google Books preview on a blog or website. Well, now Google has implemented official way to do so. Open any Google Books page (for example) and click on link option at top-right part to see pop-up box with codes that can be used to embed that specific Google Book. Copy the embed code and paste on your blog / website for easy display. 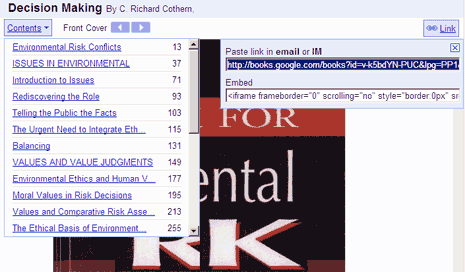 It also has option to grab direct link for specific Google Book for easy sharing on IM or email. There is another new option to browse Google Book contents with perfect ease. Just click contents link to see pop-up box with content listing and their specific page number. Sharing and accessing Google Books just became more easy with these new features.